A healthy taco salad made with fresh ingredients. 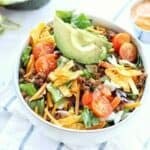 These taco salad bowls are quick and easy to make for any lunch or dinner meal. In a medium pan, brown beef until cooked through. Drain. To ground beef, add chili seasoning, cumin, garlic powder, salt, and water. Stir until well blended. In a medium-sized bowl, combine all ingredients of the Dole chopped chipotle & cheddar salad kit, except the dressing. Add the seasoned ground beef to the salad mixture, stir. Top with additional veggies, if desired, and serve.